Alan studied architecture at De Montfort University, Leicester on a part-time course during which he gained four awards for academic excellence and his Bachelor of Arts. He studied full-time for his Diploma at the Architectural Association in London, returning to De Montfort University for his Post-Graduate Diploma in Architectural Practice. 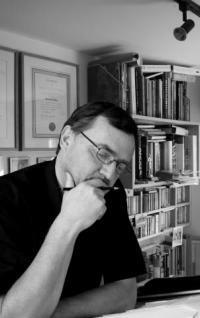 He is a Chartered Member of the Royal Institute of British Architects and a member of the Architectural Association. Alan unusually, though not uniquely, is also a qualified Architectural Technologist having studied building construction and technology at Coventry Technical College and Coventry University. He is a full member of the Chartered Institute of Architectural Technologists. In 1998 he was invited to be an Associate Member of the Chartered Institute of Building. Between 1997 and 2002, Alan was a visiting tutor and critic for third-year BA (Hons) architecture students at De Montfort University, Leicester. Alan has been in private practice since 1979. The practice has worked between Durham and Plymouth in the United Kingdom and has undertaken small projects in France, Spain and Saudi Arabia. During his career his concerns have been with changing perceptions and ideas. There is no predetermined style which allows a free response to a client’s specific need. A ten minute chat with a client may create something unexpected and beautiful even within a simple house extension. Just considering the position of the sun may just make the difference as to how a space is used and appreciated. Alan has made few statements to the press and makes fewer claims regarding his own work; however in a newspaper interview in 1992 he stated that ‘I would just like to make a difference’. He feels that art and architecture are an important stimulus and enrichment of life for everyone. He has recently appeared in a Channel Four documentary when he was filmed, albeit briefly, on the floor of Tate Modern, London doing what he likes best ‘Building with Art’.